St Michael and All Angels Church is located in the heart of Somerton, the 'Ancient Royal Town of Wessex'. Parts of the church building date from the early 13th century, whilst other parts have been added as recently as 2004. The building underwent a major internal refurbishment in 2012 and 2013. As well as housing regular worship for all ages and being a tranquil place for prayer, the church is also used for concerts and other community events especially during the annual Somerton Arts Festival and the Music @ St Michaels series between Sep-Jun. Services take place each Sunday at 8am which is Holy Communion and 11am - The first Sunday is "Cafe Worship", Second Sunday is Healing Holy Communion Service, Third Sunday is AM Worship and the Fourth Sunday is Holy Communion Service. We also regularly have a "Benefice Together Holy Communion" around the churches in the Benefice. On the first Tuesday of the Month we have T+ an opportunity to get together over a cup of tea beginning with a time of worship, the content varies with films, speakers, games and other topics for discussion. We hold a 10am Communion Service each Wednesday. We have Mattins on the 3rd Friday of the month at 10am. We also provide monthly services at Wessex House, a local nursing home, and at two Warden controlled units Parsonage Close and Laburnum Drive. There are of course additional services in the churches of the Benefice on Sundays. Details of services can be found on the website and also on the Benefice Magazine "Contact" available in church or on this website. Our other regular church activities include a number of house groups, Mothers Union meetings, regular bell ringing, and a singing/music group. We have strong links with the local school King Ina Academy who hold regular services in church and their own services in the school. 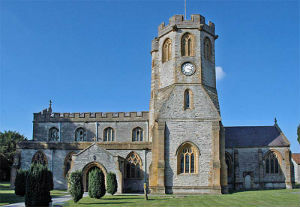 The church is located in the Market Square, Somerton. The priest-in-charge and churchwardens are ex-officio members of the PCC. James Turner (Convener), Rodger Calderwood (Secretary), Revd Alan Symmonds (Priest-in-charge), Jan Turner(Churchwarden), Alan Hilborne (Verger), Joy Rattenbury(Lay Worship Assistant), Audrey Stanford (Lay Worship Assistant), Graham Taylor (PCC). David Speed (Convenor), Janet Hayter, Jacky Calderwood, Irene Stone, Marion Hilborne(co-opted), Mary-Ann Pike(co-opted), Graham and Jean Taylor(co-opted).